Who appeared to Peter, James, and John on the Mount of Transfiguration? When are we to close talks in the name of Jesus Christ? This article is from a paper previously published in Newsletter and Proceedings of the Society for Early Historic Archaeology, April 1982, pp. 4–11. Since the early fourth century A.D., many Christians have revered the site of the Holy Sepulchre Church as that of Jesus’ crucifixion, burial, and resurrection. There visitors are shown a small rocky knoll, said to be Calvary or Golgotha, and a nearby site, a cave, is claimed to be the location of the tomb of Christ. But there are problems with this proposal. First, the stone slabs in the cave on which the Lord’s body is said to have been washed and anointed and where he was laid in the tomb are pink marble. Those stones are not native to Palestine and were undoubtedly imported from Europe much later than Christ’s death. Second, this site was designated in A.D. 326, during the time of Queen Helena, mother of the Emperor Constantine. She presumed that the remains of the tomb of Christ would be found beneath one of the Roman temples, since the Romans were thought to have covered Christian holy sites with temples of their own. She therefore razed the temple of Venus and excavated the area, finding a large cemetery. Since one of the tombs was situated within a cave, she labeled it the Holy Sepulchre of Christ. The problem is that the Romans of the second century were not concerned with Christian holy sites; Rome was fighting Jews, who would not have held the tomb of Jesus to be sacred. Although they destroyed Herod’s Jewish temple, the Romans wouldn’t necessarily have bothered the site of Jesus’ tomb. Even though the Holy Sepulchre Church has been visited by many Christians for over sixteen centuries, there really is no evidence to support its claims. In 1883 British General Charles (“Chinese”) Gordon was visiting in Jerusalem. Contemplating the scenery outside the northern wall and near the Damascus Gate of the city, he, too, noted that this prominent rocky outcropping just a few hundred feet away could have been the biblical Golgotha.3 Though the Bible does not say that Christ was crucified on a hill (Golgotha is called “the place of a skull” in John 19:17), the idea of a hill was firmly rooted in Christian tradition because of the small rocky knoll in the Holy Sepulchre Church. Gordon noted that the face of the cliff resembled a skull (the meaning of the name Golgotha), with depressions for the eyes, nose, and mouth, and that there was a tomb nearby in the cliff to the west﻿—the one originally excavated in 1867 for a cistern. He became excited about the prospects of having the site preserved for pilgrims to visit. A campaign was begun to collect funds in England and to organize the Garden Tomb Society, which ultimately purchased the plot of land and its excavated tomb. In the years to follow, a fair amount of archaeological and traditionary evidence was discovered which supported the thesis that this was an extraordinary candidate for the site where Christ had been laid to rest. The biblical tomb had belonged to Joseph of Arimathaea. In the years to come, evidence was uncovered that the Garden Tomb was, indeed, a Jewish tomb of the first century which had never been completed. It also conformed to the biblical description because it was located in the midst of a garden and near the proposed place of execution. Yet, despite the vast amount of interest in the site and the number of books and pamphlets published over the years, no single source has given the totality of archaeological evidence. Nor have all of them together considered everything that could be said. It is my hope to present here a more comprehensive view of the evidences favoring the Garden Tomb as the site of Christ’s burial and resurrection. The first thing to note is that the small hill known as “Gordon’s Calvary” is the northernmost part of the mount called Moriah in the Bible. It was to this mount that Abraham brought Isaac as a sacrifice (see Gen. 22), symbolic of the sacrifice of Christ to come. The site was later purchased by David and used by Solomon to construct his temple. The temple itself was located about midpoint on the north-south line of the hill. Significantly, sacrificial animals, whose deaths symbolized that of Christ, were slain to the north of the temple altar (see Lev. 1:11). If Jesus was crucified at “Gordon’s Calvary,” he died on the northernmost part of the hill where that altar was situated. Golgotha (as we shall henceforth call “Gordon’s Calvary”) is separated from the main body of Mount Moriah by a chasm created by an ancient rock quarry. Because the skull face is on the cliff which was cut away by the quarry, it is important to know when the quarry was in operation. If it was used after the days of Christ, the skull shape could not have been present in his time, and there would be no reason to believe that it lent the name Golgotha to the site. There are, however, some indications that the quarry predates Christ. Garden Tomb and vicinity. Inset, upper left, shows the area in relation to the northern wall of the Old City of Jerusalem. The major piece of evidence that would place the cutting of the quarry prior to Jesus’ time is the discovery of a number of rock-cut tombs of the Israelite period. These tombs are situated on the quarry cliff to the west of the skull face, very close to the Garden Tomb itself.6 Since these tombs are on the quarry cliff, and since graveyards are generally considered to be sacred places, not to be disturbed by quarrying,7 it is safe to say that the quarrying operations took place before the Israelite period. If, as this evidence suggests, the quarry cliffs stood in the days of Herod the Great, then it is inconceivable that Herod would not have made use of their defensive posture and built his northern city wall atop them. Indeed, there are some Herodian stones between the cliff and the so-called “Herod’s Gate” to the east, and parts of the cliff bedrock appear to have been sculpted to look like Herodian stones with their drafted edges. St. Stephen’s Church of the fifth century A.D. (today rebuilt with the same name) is situated adjacent to Golgotha, on top of the cliff immediately to the north of the Garden Tomb itself. The discovery of this site in 188212 provided further evidence in support of the early tradition placing Stephen’s execution here. It is likely that Jesus was executed in the same place. Excavations in the area of the Garden Tomb have revealed evidence that it was, indeed, an ancient garden﻿—not of flowers, but of fruits. A winepress discovered in 1924 can be seen at the site today, along with three cisterns, one of which has a capacity of 200,000 gallons of water. Plaster around the exterior of the tomb and in the vicinity of the large cistern has been determined to be of the Roman period, though the plaster of the cistern itself was later repaired in Byzantine times and decorated with a cross﻿—itself evidence of early Christian veneration. The Garden Tomb fits the qualifications for that of a rich Jew of the first century A.D. Several noted archaeologists have examined it and declared it to be Jewish and of the Herodian period.13 Like other Jewish tombs of Jerusalem from the same period, it is oriented toward the Temple Mount. It also resembles them in form, in that there is an outer “weeping chamber” for visitors, plus an inner chamber with burial niches for the dead. The type of chiseling inside the tomb and on the face of the cliff outside the tomb is the same as that found in other Jerusalem burials dating between the second century B.C. and the first century A.D.
Cut into solid bedrock, the Garden Tomb conforms to the biblical description of “a sepulchre that was hewn in stone, wherein never man before was laid.” (Luke 23:53.) It has a nephesh (“soul”) or window-like cut in the upper right-hand face, through which, according to Jewish tradition, the spirit of the deceased departed after the third day in the tomb. When one examines the burial niche closely, it becomes apparent that it was enlarged in the area of the head to the east, by further chiseling into the bedrock. This is probably because the person buried there was taller than the one for whom it was constructed. This evidence of a “borrowed tomb” fits the character of that of Joseph of Arimathaea, in which Jesus was buried. The Garden Tomb as it must have appeared originally. Note the low doorway, the rolling stone in the trough, and the nephesh near the ceiling of the burial chamber. In front of the tomb, there is a trough which could have served to guide a rolling stone in front of the door. (See Mark 16:3–4; Matt. 28:2.) Such rolling stones for tomb entrances are known from other Jewish tombs of the time of Jesus in the Jerusalem area. It has been argued that the chisel marks in the trough at the Garden Tomb appear to be Crusader in origin, indicating that it was perhaps used for feeding animals but not for guiding a rolling stone into place in front of the tomb entrance.14 Nevertheless, the trough has the same width as the rolling-stone trough at the so-called “Tomb of the Kings,” another Jewish tomb from Jesus’ day. Moreover, the low wall forming the front part of the trough is some six to eight inches higher than the bedrock forming a court in front of the tomb. If the trough were an afterthought, it would have had to be formed by lowering the entire rocky courtyard by chiseling, which is not the case. If the chiseling is of the Crusader period, it is more likely to have resulted from efforts to deepen the channel, rather than create it. The height of the doorway is important for understanding the biblical story, in which both John and Mary Magdalene had to stoop down to look inside the tomb. (See John 20:5, 11.) From this position, each was able to see the spot where Jesus was buried, which again points to the burial niche in the northeast corner. It was probably because of the light entering through the nephesh that they were able to discern the interior of what would otherwise have been a dark tomb. The reason for the missing door and front wall of the Garden Tomb (the latter now filled in with masonry) can probably be traced to the construction of a Byzantine church on the site in the fourth century. Evidence for that church takes the form of mosaic decorations found at the site (remnants of flooring), as well as the arching and holes for ceiling-beams found above the tomb entrance. The Garden Tomb today. 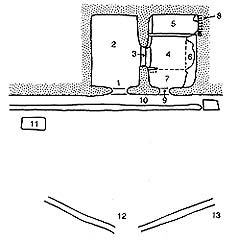 In evidence are supports (1) for the arches of a Byzantine church, along with niches (2) which may have held roof support beams. The front of the tomb was destroyed when it became a shrine but was filled in with stones (3) in modern times, though leaving a high doorway (4) in place of the original low one. The nephesh (5) remains, as does an anchor/cross symbol (6). The trough (7) for the rolling stone is still visible. Atop the cliff is a stone wall (not shown), separating the Garden Tomb property from that of the Convent of St. Stephen. Long grooves in the bedrock floor in front of the tomb may have supported a low screen, typical of Byzantine churches. The screen would have separated the congregational area from the area where the priests officiated, with the tomb proper (its front wall having been knocked out) serving as a shrine in the tripartite setup. It has recently been suggested that the grooves were a single water channel used to drain a baptismal font in “heart” shape which stood in front of the tomb. This seems unlikely to me, for the grooves are not now connected in the middle. Also there is no evidence that the low depression in the bedrock to the right of the grooves was the base of a baptistry. The rectangular depression in the bedrock floor to the left of the tomb entrance was possibly for a reliquary﻿—a box containing bones or other relics of some early saint. These were common in Byzantine churches. Byzantine crosses adorn the interior of the tomb, and two of the most elaborate of these, having been painted on the wall, have faded since the tomb’s discovery. Others﻿—both painted and carved﻿—remain, as does a large embossed plaster cross in the larger cistern. Another cross is carved on the outside wall of the tomb, to the left and just above the height of the doorway. Close examination shows that it was originally an anchor which was later extended and changed into a cross. The anchor, along with the fish, was a very early Christian symbol and may indicate a first-century veneration of the tomb site. 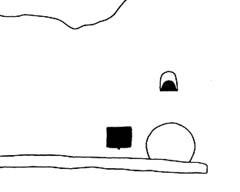 Ground plan of the Garden Tomb. (1) The doorway. (2) The weeping chamber. (3) Threshold and steps. (4) The burial chamber. 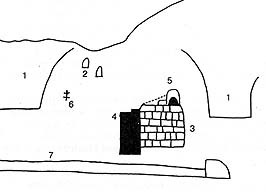 (5–7) Burial niches. (8) Chiseling to lengthen the burial niche. (9) The nephesh. (10) The trough for the rolling stone. (11) A rectangular depression in the bedrock, possibly to hold a reliquary in the Byzantine church. (12) Grooves in the bedrock, probably to stabilize a screen in the Byzantine church. (13) A depression (now filled with flat stones) thought by some to be the remains of the baptismal font. On the plateau above the low cliff into which the tomb is carved sits St. Stephen’s Church amidst ruins of earlier structures. A cemetery of the Byzantine period, located almost immediately above the Garden Tomb itself, is included among the archaeological finds of the site. Two of the inscriptions lend evidence to the authenticity of the tomb as being that of Christ. One reads “Buried near his Lord”﻿—possibly referring to the proximity of Jesus’ tomb. The other reads “Onesimus, Deacon of the Church of the Witnesses of the Resurrection.” What better place for a church dedicated to the witnesses of the resurrection than the place where that marvelous event occurred? In this inscription, we possibly have the name of the Byzantine church which once stood before the tomb entrance. As circumstantial as some of the evidence may be, one thing is certain about the Garden Tomb: It fits all the qualifications for the tomb in which Jesus was buried, from both the archaeological and the scriptural points of view. Indeed, the Garden Tomb is by far the most suitable candidate for the authentic tomb of Jesus Christ. 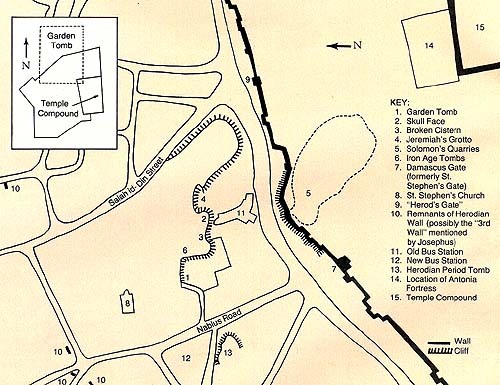 For further information, see the brochure, Jerusalem: The Garden Tomb, “Skull Hill” and the Garden of the Resurrection (copyright by Palphot, Jerusalem, and printed in the late 1970s for the Garden Tomb Association). For an excellent map showing archaeological remains in Jerusalem, contact the American Institute of Holy Land Studies on Mount Zion in Jerusalem. See Barauth C. Schick in Palestine Exploration Fund Quarterly Statement (hereafter referred to as PEFQS), Apr. 1892. See Gordon’s article in PEFQS, Apr. 1885. See the brochure by Isaac Sachs, Solomon’s Quarries, published by the Jerusalem municipality (n.d.), p. 13. If it were to become possible to examine the plaster inside the cistern, perhaps one could ascertain its date. However, the property is part of a Muslim cemetery. Schick, in PEFQS, July 1886, p. 155, describes these tombs. A few years ago, an archaeologist associated with the Albright Institute in Jerusalem (and also a member of the Board of Trustees of the Garden Tomb Association) told me of an Iron Age tomb excavated about 1922 along the cliff face under the north wall of the Old City, which would conclusively prove that the quarry was cut prior to the Tomb’s time. However, I have as yet been unable to obtain any information on this excavation. The prohibition against desecration of tombs has, of course, sometimes been ignored in the case of invaders. For example, the Babylonians desecrated Jewish tombs, as is known both from Jeremiah and from archaeological evidence. There is still much debate about whether the Herodian work in the Damascus Gate area dates to the time of Herod the Great or to that of Herod Agrippa II. Kenyon believes the gate to be late, while a large number of other scholars date it before Christ, pointing to the existence of Agrippa’s wall farther north (the “Third Wall” mentioned by Josephus). Though the question is an important one, we do not have room to discuss it here. See Conder in PEFQS, Apr. 1890, pp. 69–70. See Rev. J. C. Hanauer in PEFQS, July 1892, p. 199. See also PEFQS, Oct. 1902, p. 307. See Jerusalem: The Garden Tomb, Golgotha and the Garden of the Resurrection (London: The Garden Tomb Association, 1955), p. 19; hereafter referred to as JGT. Note that the “St. Stephen’s Gate” and “Church of St. Stephen” to the east of the Old City did not receive their names and identification with Stephen until the eighteenth and nineteenth centuries. These include Dame Kathleen Kenyon, Sir Charles Marston, Sir Flinders, Petrie, and others. See the London Daily Telegraph Magazine of 27 March 1970. It is claimed by some﻿—and perhaps rightly so﻿—that there are sockets chiseled into the rock at the entrance which would have held the hinges for a wooden door. These, however, could easily have been added after the doorway was heightened. Moreover, since stone doors are known to us from Jewish tombs of the second through the fifth centuries A.D., there is no reason to assume that the door was wooden. Today, the Garden Tomb Association has on display in Jerusalem examples of both stone doors and rolling stones found at other tombs in the city. John A. Tvedtnes teaches evening classes at the BYU Center in Salt Lake City while working toward his doctorate. He teaches Sunday School in his Kearns, Utah, ward.